There are rude slogans daubed all over the school minibus. And that's not all. The whole thing has been smashed up and it needs mending. Fast. As usual, Barny Gobbo comes up with a plan. 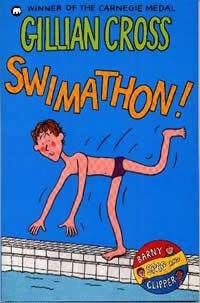 He challenges Thrasher Dyson and his friends to a swimathon and he is counting on Clipper and Spag to help him win. But then he discovers that Clipper can't swim. Can Barny and Spag teach her in time?